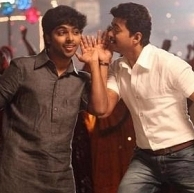 When we investigated further, we heard that it is indeed for the film that Atlee had proposed to Ilayathalapathy Vijay. The word is that Vijay has given his nod for the project. Meanwhile, GV Prakash completed his 25th film in 2012, with Thaandavam and to complete yet another 25 in a span of less than 2 years is an extraordinary achievement. Meanwhile, his long list of upcoming musicals also includes, Naan Sigappu Manithan, Saivam, Pencil, Kakka Muttai, Irumbu Kuthirai and Eetti. We wish him all the best for his 50 and many more! Mani Ratnam’s next, nothing like Thalapathy! Will Ilayathalapathy Vijay make it official soon? Why Is Vijay-Murugadoss Project The Most Anticipated? Jilla - (As) Usual Vijay Film. People looking for online information on Atlee, GV Prakash, GV50, Raja Rani, Vijay will find this news story useful.